Candidates Are Easier To Take Sitting Down : It's All Politics Unlike the previous half-dozen debates, this one took place around a table. And by sitting everyone down, the sponsors managed to elevate the discussion. We've all heard a lot about how the American family sits around the kitchen table, talking about making ends meet. It doesn't matter that most families don't actually do that. It's an image as common to campaign rhetoric as the family farm. It's a Norman Rockwell painting, an icon of deep tribal memory. We've also all heard a lot about how a leader gets all parties to come to the table. And about how important it is that everything be on the table. And how you can't leave anything on the table. The table is a potent figure of speech, like the proverbial level playing field everyone is always trying to create. But the table can be more than a meaningful metaphor. It is also a physical thing that has actual effects. When you get people to sit down at a literal table, they look different and they act differently. In fact, they look and act better. 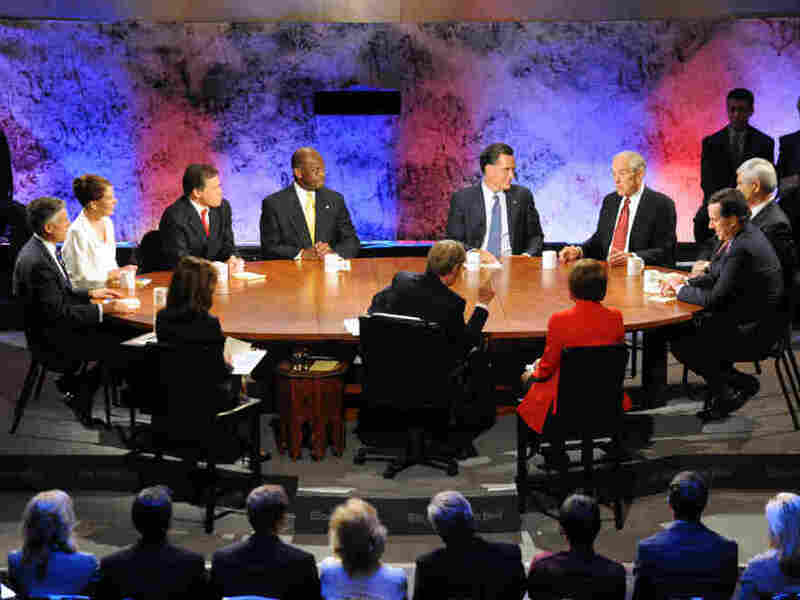 Consider the eight Republican candidates for president who met at Dartmouth College in Hanover, N.H., Tuesday night for another debate in their long-running series. Unlike the previous half-dozen rounds, this one took place around a table. And by sitting everyone down, the sponsors managed to elevate the discussion. The candidates had plenty of opportunity to badger and beard each other, but they did so in a more civil and substantive manner than in any debate to date. Their proximity to each other made bombast more difficult, or at least more obvious when it occurred. In the previous debates, the candidates waited behind their lecterns like so many trained seals eager to balance the ball on their snouts. The would-be presidents have stood as in a police lineup, confronted by a battery of inquisitors firing questions so adversarial that audience and candidates alike often objected out loud. But not in Hanover, where the table setting clearly altered the dynamic. All sat on a single plane, sharing in a discussion that at least visually included everyone. That eliminated the sense of candidates as prisoners in the dock and journalists as prosecutors hurling accusations. Charlie Rose of PBS, with his easy-going dishevelment and roundabout style, seemed a half-step behind the proceedings as moderator. But no matter. The strength of the evening was in the strong presence of Karen Tumulty from The Washington Post and Julianna Goldman of Bloomberg News, who went at the candidates with unblinking and undaunted inquiries. Most of the candidates rose to the challenge. Mitt Romney was once again well prepared for the attacks he would face, hitting the facts of his case with force and yet remembering to project concern and empathy. Rick Perry, somewhat lost during stretches of the debate, got chances to reiterate his Texas theme, stressing that all would be well if the energy industry were left alone to create jobs. Herman Cain took a hammering from just about everyone on his 9-9-9 tax overhaul, but defended himself with humor and forceful simplicity. Yet everyone at the table appeared to be part of the discussion, even when they were not. No one was forced to stand alone for long segments of the evening, wondering why he or she was even onstage. Also absent was the sense of an audience just beyond the lights lusting for blood. Unlike earlier debates where audience members cheered the number of inmates executed in Texas and booed a gay member of the U.S. armed forces in Iraq, the audience here erupted only occasionally in applause. There was no whooping and shouting. Clearly the organizers had worked to create a less distracting atmosphere, but the rubric of the table helped make that possible. In recent years, both parties have experimented with the sit-down format in both primaries and general election debates. And both parties should consider the enormous contribution the format makes to the quality of the discussion. Every campaign offers plenty of opportunity for candidates to stand on their feet and declaim. What is needed is more chances for them to put their feet under a common table, look each other in the eye and talk sense.